Frasers Centrepoint Trust (“FCT”) is a real estate investment trust (“REIT”) listed on the Singapore Exchange Securities Trading Limited (the “SGX-ST”) on 5 July 2006. FCT’s financial year commences on the 1st of October. 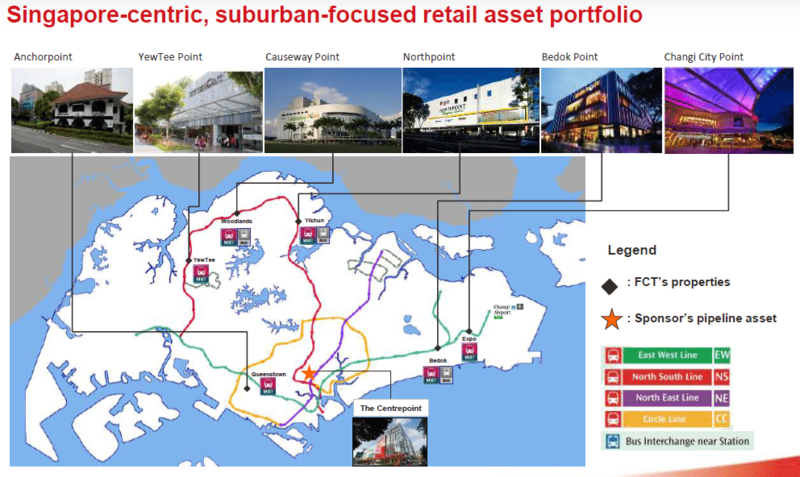 FCT’s property portfolio comprises the following suburban retail properties in Singapore: Causeway Point, Northpoint, Anchorpoint, YewTee Point, Bedok Point and Changi City Point (collectively, the “Properties”). 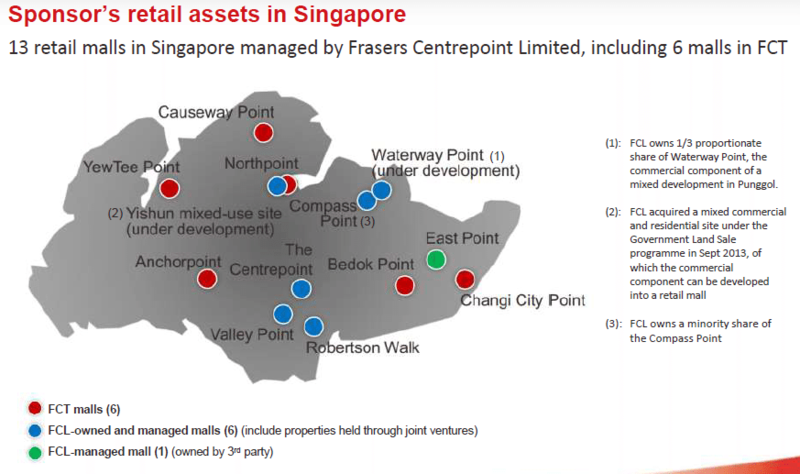 The REIT also acquired its latest property, the Changi City Point (“CCP”) on 16 June 2014. Frasers Centrepoint Limited (“FCL”), FCT’s sponsor and largest unitholder, owns 41.26% of FCT. The major shareholders of FCL are Thai Beverage Public Company Limited (“ThaiBev”) and TCC Assets Limited (“TCCA”). Both companies are related to Thai Billionaire, Charoen Sirivadhanabhakdi, the second richest man in Thailand. This information is updated as at 28 November 2014. For the basics of what is a Real Estate Investment Trust and how a REIT is normally structure, check out our REIT 101 article. How does FCT achieve growth? FCT, like all other REITs, could undertake three forms of organic growth: increase rental, asset enhancement initiatives (AEIs) and capital recycling. To experience inorganic growth, FCT could either acquire other properties or conduct greenfield developments. Let us discuss each method of achieving growth. The concept behind rental increase is simple for a retail REIT like FCT: increase shopper traffic to the malls, and you can command higher rents. Retailers always want to be where shopper traffic is heaviest. With increased demand for such spaces, REITs with high traffic malls can command higher rents from their tenants. Being located next to a train station or bus interchange is a plus, as is any factor that will attract people to the malls. All of FCT’s properties sit close to a MRT station, and are evenly spread out across the island in suburban towns (hence the risk of cannibalisation is low). Rent reversion is one metric that REIT investors could use to track rent rates. It is the difference between average rental rates for the new lease and the preceding lease usually contracted 3 years ago. A positive rent reversion means that rental rates have increased. AEI, at its heart, is about maximising productivity per square foot. This can be achieved by upgrading tenant mix or revamping the entire mall to make it look newer, which can in turn increase rents. 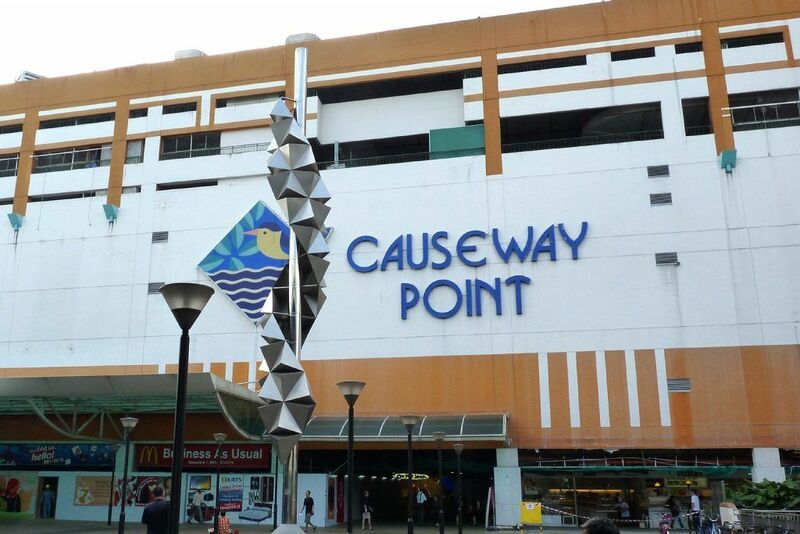 FCT has in the past performed makeovers at Causeway Point, Northpoint and Anchorpoint. 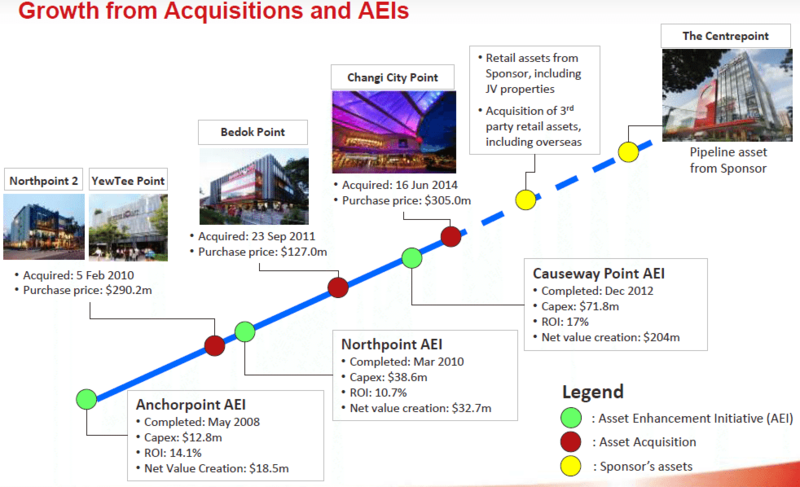 These AEIs produced at least 10% ROI for FCT, and a total of S$255m in net value creation, which is basically the difference between the cumulative gains in property valuations and the CAPEX relating to the AEIs. Capital recycling involves disposing of not-so-great properties, freeing up cash, and using the cash to acquire a property with better prospect. FCT has never done this, but we can’t rule out the possibility of FCT doing this in the future (read more under opportunities). Inorganic growth can be achieved through acquisitions or greenfield development. FCT has made 4 acquisitions since 2010 (see below). REITs that undertake greenfield development would buy land to develop property just like a property developer. But local REIT regulations restrict a REIT’s spending in greenfield developments to a maximum of 10% of its asset value. To evaluate operational performance of FCT, we should look at occupancy rates of each property, shopper traffic, gross revenue, net property income (NPI), as well as rent reversion as mentioned earlier. What are other metrics to analyse FCT’s performance? We have not mentioned how a REIT control its financing needs. Singapore REITs are legally required to distribute at least 90% of their distributable profit to unitholders. Unlike non-REIT companies that usually retain a chunk of their net profit for reinvestments, REITs do not have the privilege of keeping their profit and reinvesting them for future growth. So if a REIT manager wishes to grow, it needs to raise additional funds. This explains why many REITs, if not all, have relatively high gearings as they sought funding from capital markets and banks. This means that as a REIT investor, one needs to be able to identify the REITs that are not just able to grow (that can increase their rentals or acquire the best properties), but also capable of skilfully managing their funding needs. A couple of financial metrics that one should look at would be: gearing (total borrowings/total assets), interest coverage (EBIT/interest), debt maturity profile (the more spread-out and the longer the better), funding sources (the more varied the better), and proportion of secured debt to all debt (the lower the better). A healthy, well-managed financial profile, such as low gearing, will put the REIT in a more favourable position to capture opportunities when the time is ripe (such as in a property downturn when properties are cheap everywhere). In this case, the REIT can take on additional debt without too much worry about busting its gearing limit and breaching a debt covenant. How has FCT been doing? Let us now use these metrics to assess FCT’s past performance. On the operational front, most of FCT’s properties appear to be doing quite well. Occupancy rate stood at 96.5% as at 30 June 2015, while shopper traffic has been steady over the past few quarters. Rental reversion has been positive in 2015 (see screenshots below). Bedok Point’s occupancy rate in the latest quarter sticks out like a sore thumb. Management says they are discussions with prospective tenants are ongoing. Now from the recent occupancy rates and rental reversion rates, it is quite obvious that Bedok Point is the lousier performer of the lot. Its rental reversion rate has been negative since 2013 (Bedok Point was acquired only in September 2011, so no reversion rate in 2012). This resulted in lower NPI from Bedok Point every year since 2013. 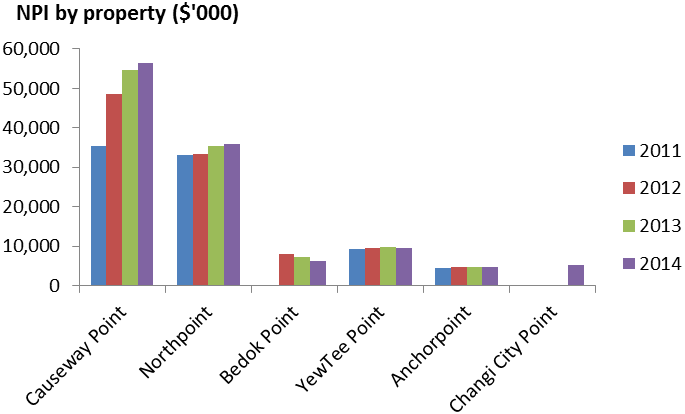 Occupancy rate has fallen significantly since 1Q14, as tenants opted not to renew their leases. If we broke down shopper traffic by malls, we see that Bedok Point is the only one suffering from a decline in shoppers, while the rest stayed the same or increased. What exactly happened? 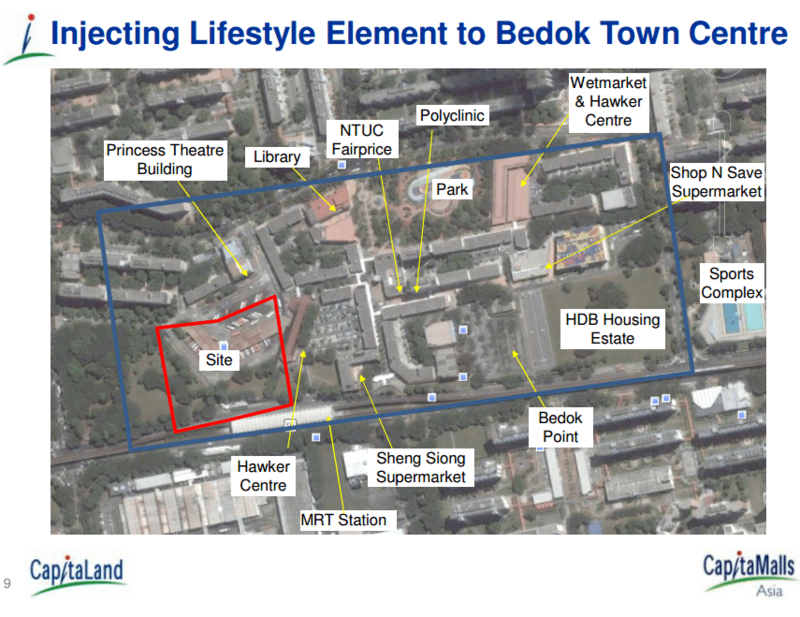 First of all, Bedok Point is not located right next to the MRT, although it is still within walking distance. This was not so much of an issue at first. 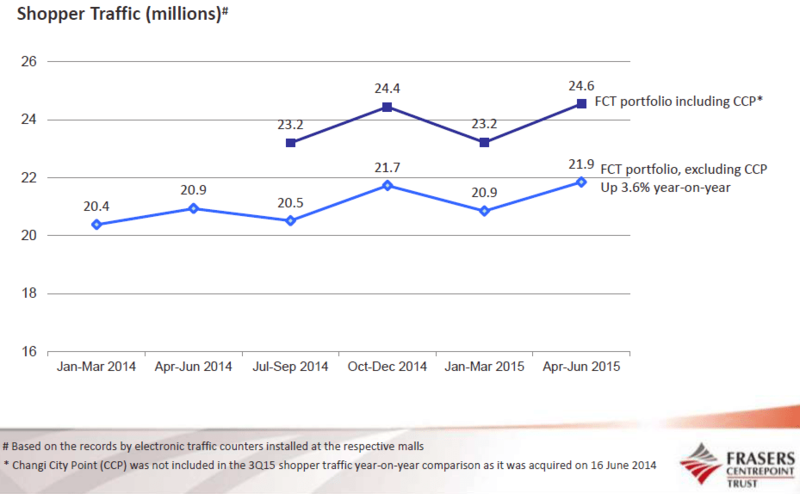 But when Bedok Mall opened its doors in December 2013, shopper traffic at Bedok Point dramatically fell. Some of Bedok Point’s tenants also decided not to renew their lease, opting to move either to Bedok Mall to benefit from the higher traffic or elsewhere. An integrated bus interchange opened at Bedok Mall the following year, bringing even more traffic to the mall. It was no secret in 2010 that a new mall would be built in Bedok. 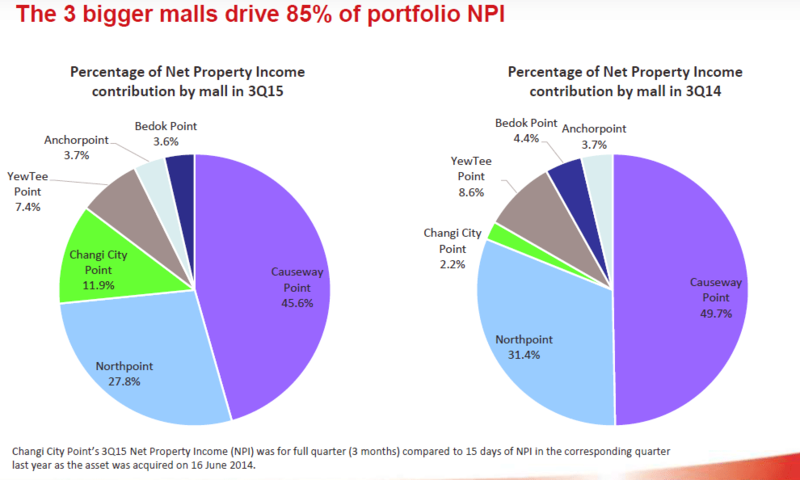 On the bright side, Bedok Point’s contribution to NPI is only 3.6%. FCT’s 3 top contributors – Causeway Point, Northpoint, and Changi City Point (which is FCT’s latest acquisition) – should be our primary focus. But we’ll talk about them under ‘Opportunities’. For now, let’s return to evaluating FCT’s performance. Its sources of funding currently include secured and unsecured bank borrowings, and a $500m MTN program established in 2009. FCT appears to be managing its borrowing costs and finances well. Gearing levels remained healthy at about 30% over the last 4 years, while interest coverage soared as average cost of borrowing fell (but more on this point later under risks). For long-time unitholders, the stellar operational performance of FCT has translated into increasing DPU since 2006. FCT’s success begs the question – can its performance continue? Is there more room for growth? We shall attempt to answer these questions here. To determine if FCT’s success would continue, we must first understand how it has managed to get to where it is today. FCT has in the past relied quite heavily on AEIs. Its refurbishment works at Causeway Point and Northpoint have helped bolster NPI. Could FCT continue to use the same strategy going forward? It still has three malls in its portfolio that have yet to undergone AEIs. But these are fairly new assets, which leads me to believe that FCT would not implement AEI on any of these malls any time soon (at least not in the coming year). Could there then be room for higher rents? This is highly likely, given that its largest contributors, Causeway Point, Northpoint, and Changi City Point, are located in growth areas earmarked by the government. For example, the Urban Redevelopment Authority (URA) has already embarked on plans to develop Woodlands into a regional hub, which will likely be done by 2020 or so. Yishun will also be rejuvenated, with upcoming major developments such as Northpoint City, and Changi Business Park expanded. 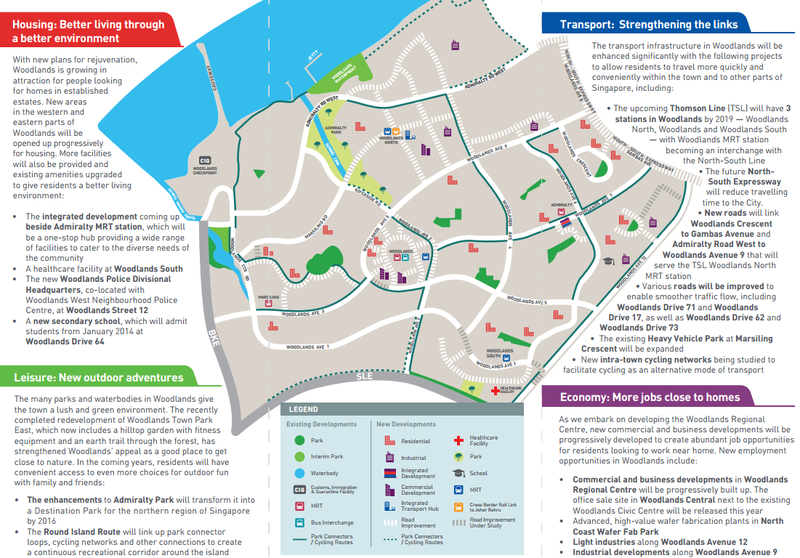 These developments will likely boost land and property value, as well as rental rates. FCT also has the option of recycling its capital. If the REIT does explore this option, there is a risk of not fetching a good price for its existing properties and also overpaying for its future properties. Also, even if a REIT manager is patient enough to wait for a good opportunity while letting its cash sit on its balance sheet, its investors may not be so. Lastly, as mentioned before, FCT could continue to grow by acquisitions. Its parent sponsor, FCL, has a number of properties on its balance sheet that could eventually be deposited into FCT. All of FCT’s past acquisitions (Changi City Point, YewTee Point, Bedok Point, Northpoint 2) were formerly owned by FCL. It will not be surprising to see FCL, in striving to become more asset-light, attempt the same thing again in the future. What one needs to look out for then is whether the price paid for the acquisition is fair, and whether the acquisition would generate higher DPU for the REIT. Truly yield-accretive acquisitions are rare, and one will need to develop good judgement to spot one. Do note that despite these opportunities, FCT’s stock is not necessarily a “Buy” at today’s price. As value investors, we must remind ourselves that a company with a great business doesn’t always translate to a great investment. A good company that has an overvalued stock is not a good investment because you would then be buying something that is more than it is actually worth. FCT, with its current capitalisation rate of approx. 5% (computed by dividing NPI by total property value) and a stock price that is trading at about 107% of its NAV, may or may not be cheap today. It all depends on your estimation of its future growth potential. I will end this write-up with a couple of risks. I have identified mainly two. There could be more, but these two stood out most. The first is a higher refinancing risk for FCT versus its peers like CapitaLand Mall Trust (CMT). 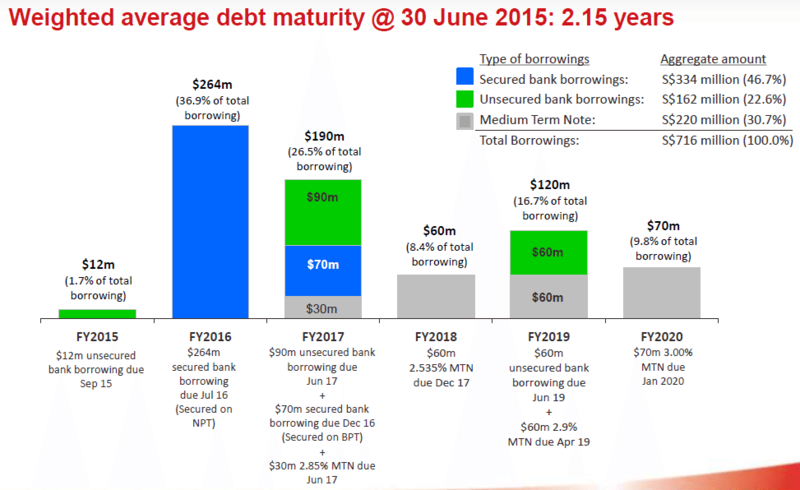 Earlier, we saw in FCT’s debt maturity profile that its average term to maturity is 2.15 years. This means that by the end of about 2 years, FCT will have to seek funding either from its banks or the capital markets. Anything can happen in a short span of 2 years – interest rates could go up and borrowing cost for FCT would increase. On the other hand, CMT has a longer term to maturity. As at 31st March 2015, term to maturity is 5.1 years, which is more than twice that of FCT. So while FCT has been consistently attaining lower borrowing cost, it pays to ask whether this lower cost could be sustained in the long term. What if the financial markets crash in 1H16, and like in the 2008 GFC, capital markets freeze up and FCT fails to refinance its upcoming loan ahead of July 2016? I am merely speculating – again, it may or may not happen, but the danger is real. At this juncture, it is probably worth bringing up the recent REIT ruling by the Monetary Authority of Singapore (MAS) and discussing its impact on FCT here. Back in October last year MAS had published a consultation paper proposing a list of changes to the Singapore REIT regulations. It has since refined its proposal and would be rolling out these new rules on 1st January 2016. Of these changes, there is one worth highlighting. As highlighted above, all REITs will now be allowed to leverage up to 45% compared to the previous 35%, regardless of whether the REIT has a credit rating or not. This ruling, fortunately, does not impact FCT (at least not yet), because FCT has over the years managed to keep its gearing ratio below 30%. So there is still much room for FCT to leverage up, if it ever needs to. The second is high concentration risk. With Causeway Point and Northpoint as the largest contributors, FCT’s NPI and DPU could take a big hit if FCT could not keep its rental rates at its current levels. The threat is especially real for Causeway Point. The two regional hubs, Tampines and Jurong, have more than one mall in each region after all. It should not come as a surprise if a new shopping mall is built in the vicinity of Causeway Point in the future. 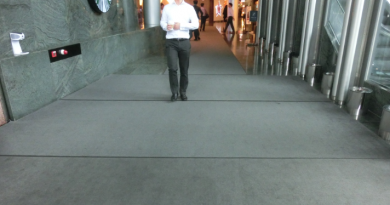 This will reduce shopper traffic at Causeway Point. To stay competitive, FCT may have to lower rents, unless of course, the demand exceeds supply. To summarise, opportunities are plentiful for FCT. As the government continues to develop the suburban areas, FCT’s malls are well-poised to benefit from increasing traffic and higher property valuations. Unitholders can look forward to greater contribution from Changi City Point as its tenant mix stabilises. They can also expect some interesting developments at Woodlands and Yishun. In the short-term, they should watch out for FCT’s upcoming bond refinancing. We will only provide you with information relevant to value investing. You can unsubscribe at any time. Your contact details will be safeguarded The information provided is for general information purposes only and is not intended to be any investment or financial advice. All views and opinions articulated in the article were expressed in Jessie’s personal capacity and do not in any way represent those of his/her employer and other related entities. Jessie does not own any companies mentioned. ← What Is A Real Estate Investment Trust (REIT)? 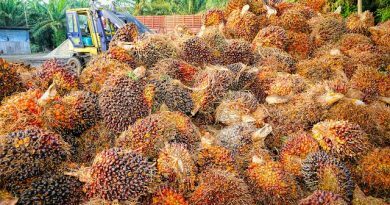 Should You Invest In United Plantations Bhd?